I am SO excited tonight to feature a GUEST POST for the very first time on Katie Loves Horror. My friend and former co-worker, Ellis, has been a supporter of the blog since day one and I couldn’t be more thrilled that he agreed to write a guest post about a movie he recommended to me a few years ago. I finally took his advice and watched John Carpenter’s In the Mouth of Madness. I couldn’t agree more with what Ellis wrote below! “This is a 1994 film directed by one of the kings of horror, John Carpenter. It holds the distinction of being the only (as far as I know) good adaptation of H.P. Lovecraft’s style of horror, probably because it’s not directly based off of one of his short stories and instead borrows the tone. 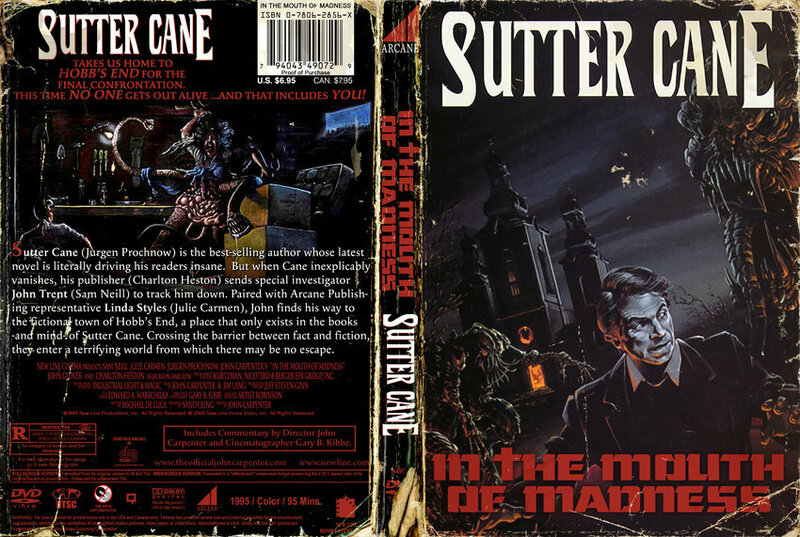 The film follows an insurance investigator (Sam Neil) trying to find Sutter Cane, a novelist who’s gone missing with the manuscript for his last novel in a set of horror films. The publishing company is understandably eager to get the film, since the anticipated sales figure stand to make Harry Potter look like chump change. He’s joined by a rep from the publishing company (Julie Carmen), and together they try and find the novelist.